U.S. Space Command Revived; Pence Unveils Plan In Florida "A new era of American national security in space begins today," the vice president said at the Kennedy Space Center in Florida. Vice President Pence announced the revival of the U.S. Space Command, saying Tuesday that it will oversee more than 18,000 military and civilian personnel who currently work "in space operations for our national security." U.S. military operations in space are back under a single unified command after President Trump ordered the Defense Department on Tuesday to revive the once-retired U.S. Space Command. Vice President Pence outlined the plan during a visit to Florida's Kennedy Space Center. "Today, there are more than 18,000 military and civilian personnel working in space operations for our national security all across the Department of Defense," Pence said. The vice president added that under Trump's directive, Space Command will "integrate space capabilities across all branches of the military; it will develop the space doctrine, tactics, techniques and procedures that will enable our warfighters to defend our nation in this new era." "A new era of American national security in space begins today," he said. As Pence began his remarks in Florida, the White House made the move official by releasing an executive memorandum from Trump to Defense Secretary Jim Mattis establishing the Space Command. The same entity was first created in 1985, but it was merged into Strategic Command in 2002. 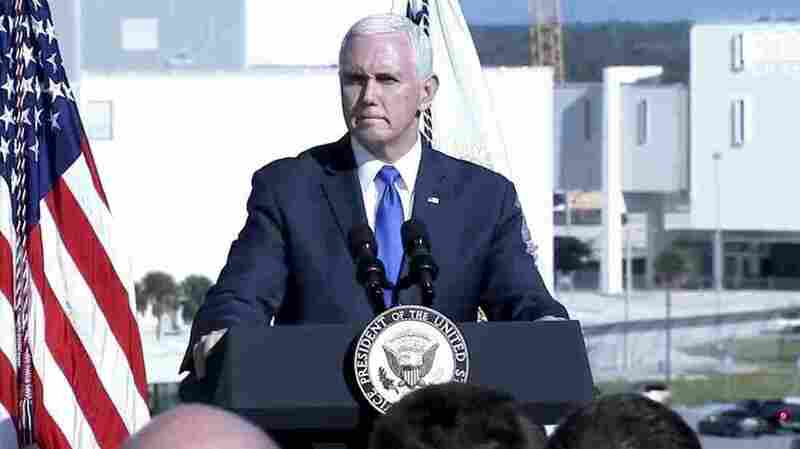 Pence had been in Florida to watch the launch of a next-generation GPS satellite, which had been slated to lift off from Cape Canaveral Air Force Station on Tuesday morning. SpaceX scrubbed that launch due to weather and a computer issue, but it didn't stop Pence from detailing the plan for Space Command. The revived entity is different from the "space force" that both Trump and Pence have been discussing this year. That more ambitious plan calls for creating a sixth branch of the U.S. military — an act that would require approval from Congress. Pence said the White House still wants to create a U.S. Space Force and that it will be part of a space policy directive Trump will sign in the coming days. As for a timeline, he added that the administration is in talks with congressional leaders to "stand up the United States Space Force before the end of 2020." With Tuesday's memo, Space Command will return as a unified combatant command, a designation it now shares with 10 other military entities, including Central Command (which oversees operations from West Asia to the Middle East), Cyber Command and Special Operations Command. The return of Space Command was written into the John S. McCain National Defense Authorization Act for the 2019 fiscal year. That legislation said the unified force would be used to carry out "joint space warfighting operations," and that "all active and reserve space warfighting operational forces" would be under its command. Trump plans to nominate a four-star general or admiral to lead Space Command, along with a deputy commander. Both of those posts will require Senate confirmation. "I assign to United States Space Command: (1) all the general responsibilities of a Unified Combatant Command; (2) the space‑related responsibilities previously assigned to the Commander, United States Strategic Command; and (3) the responsibilities of Joint Force Provider and Joint Force Trainer for Space Operations Forces. The comprehensive list of authorities and responsibilities for United States Space Command will be included in the next update to the Unified Command Plan."